Strategically located in a dynamic business district in Heidelberg, this business centre offers modern offices and meeting rooms, equipped with advanced technology and provided with a wide range of services and facilities. 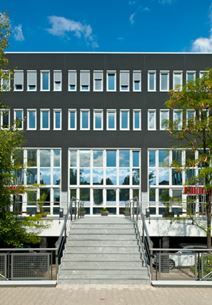 These office spaces benefit from excellent connections to Heidelberg station and Frankfurt airport. Surrounded by leading company and well served by public transport, this renowned business location will enhance the image of your company. These spaces are configurable to suit your needs, whether you enjoy working in a relaxing private atmosphere or in creative larger groups when working on projects. The style of the centre ensures there is plenty of opportunity for professional networking and social events, allowing you to expand your business contacts and self-development. There are plenty of amenities to choose from in the area, including shops, restaurants, cafes and hotels. This centre is in an ideal location in the heart of the Rhine-Neckar metropolitan region, Heidelberg and is optimally connected to Frankfurt and Mannheim. By becoming part of this community, you with have access to many other business lounges around the world and the use of 50 million Wifi hotspots around the world. These modern offices and meeting rooms are fully equipped with high-quality furniture, Wifi and phones. A selection of offices fully furnished to a high standard is available to let in this modern business centre. Equipped with meeting rooms and videoconferencing facilities, they are provided with telephone and administrative services offered by a highly skilled support staff. This centre is located in one of the most important business districts of Heidelberg and benefits from easy access to the motorway.